PMRA shares some shortfalls with pulmonary CT angiography. These include lower spatial resolution, which results in a low yield in the detection of lesions in the subsegmental and smaller pulmonary arteries and branches in clinical studies (see the image below). Because the number of patients in previous studies was small, wide acceptance of the techniques and validation of the results have not occurred yet. In the PMRA-aided detection of PE, several investigators reported a sensitivity of 100%, a specificity of 95%, and positive and negative predictive values of 87% and 100%, respectively. Gadolinium-based contrast agent was administered, and imaging was performed by using a body coil and a 1.5-T system with fast gradient-echo capability. Pulmonary angiography. Maximum intensity projection of a T1-weighted MRI acquired after the intravenous administration of contrast material shows a normal-appearing pulmonary arterial tree. The resolution is limited to the third- and fourth-order branches. Patients in the last 2 studies described did not receive contrast agent, and findings were correlated with those of DSPA. Concerning these and other study results, Meaney et al wrote, "Because of the small number of patients and the even smaller number of positive studies, however, the confidence limits are large and optimism must be tempered by caution." The study protocol required thoracic MRI for the diagnosis of PE followed by MR venography for the diagnosis of DVT. The diagnostic precision of the thoracic MRI protocol was previously compared with 16-MDCT angiography, the MR venography technique was compared with fluoroscopic venography, and results have been published . For this reason, the study protocol did not require a reference standard. In fact, the study population included patients participating in studies of the diagnostic accuracy of MRI. MRI was available both day and night. CT was performed not longer than 1 hr before or after MRI; duplex sonography was performed before MRI; and fluoroscopic venography, after MRI. The following MRI protocol was followed as long as the clinical situation of the patient permitted it. If the protocol had to be aborted, diagnosis was made on the basis of sequences completed by that stage. The examination could be stopped after real-time MRI if an acute thoracic disease fully explaining the patient's condition was detected without any sign of PE, and if no further diagnostics were required. Thoracic MRI was performed first, followed by MR venography. Thoracic MRI—The protocol for pulmonary MR diagnostics consisted of three parts, with the most robust techniques applied first, followed by techniques for more subtle diagnostics in patients who tolerated longer imaging times: real-time MRI for emergency imaging, perfusion MRI, and contrast-enhanced MR angiography. Detailed parameters have been published . The MRI examination started with the patient lying in the supine position on the examination table, with his or her head oriented toward the magnet. A six-segment phased-array body coil was placed on the patient's chest, supplemented by corresponding segments of the table's array coil. Contrast material was applied through a peripheral venous access (a 20-gauge needle in an antecubital vein) with a power injector (Spectris, Medrad). No ECG was routinely performed because no cardiac-gated sequences were applied. Thoracic MRI: real-time MRI—With nonsegmented true fast imaging with steady-state precession sequences (true FISP, balanced fast-field echo, FIESTA [fast imaging employing steady-state acquisition]), 320 50%-overlapping images were acquired in three orthogonal planes and covered the entire thorax from the pulmonary apex to the hepatic portal vein. Predefined oversized imaging areas superseded an individual adaptation of slice position or sequence parameters. Sequence parameters were TR/TE, 3.1/1.5; flip angle, 59°; bandwidth, 1,000 Hz/pixel; slice thickness, 3-4 mm; field of view, 340-360 mm; matrix size, 156-192 × 256 pixels; and an acquisition time of 0.4-0.52 sec per slice. Every segmental vessel was depicted in three orientations on at least two images per orientation. Motion artifacts could occur only during the acquisition time of 0.5 sec per image, so that the sequences were in fact robust to motion artifacts. 0-300 mm (depending on the patient's thoracic diameter). The voxel size was 2.9 × 1.6 × 10 mm, and a typical acquisition time was 1.6-1.7 sec. Gadopentetate dimeglumine, 0.125 mmol/kg of body weight, was injected at 4 mL/sec at the start of the sequence. Twenty-five repeated measurements covered the first and second passes of the contrast medium bolus in 45 sec. The lung was covered from the apex to the diaphragm, thus neglecting posterobasal parts of S-10. 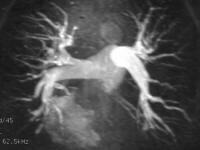 Thoracic MRI: MR angiography—A 3D FLASH sequence was started with a second injection of 0.125 mmol/kg of body weight of gadopentetate dimeglumine at 4 mL/sec after a bolus timing sequence (3.2/1.4; flip angle, 25°; field of view, 340 mm; 512 × 384 pixels; 80 coronal partitions; voxel size, 0.7 × 1.2 × 1.5 mm; parallel acquisition with GRAPPA [generalized autocalibrating partially parallel acquisitions]; 24 auto calibration lines; acquisition time, 14 sec). MR venography—Indirect venography immediately followed thoracic MRI using the contrast media already applied for the thoracic MRI examination. The patient was moved to an MRI-safe couch using a transfer mattress, the couch was turned around, and the patient was repositioned feetfirst on the examination table. The infusion line and the phased-array coil were removed and a peripheral angiography phased-array coil was attached, and a quadruple phased-array coil was placed on the patient's pelvis and abdomen. Detailed parameters of the MR venography protocol (also 3D FLASH) have been published previously [. After scout views, the lower leg, including the calf; upper leg; and pelvis were imaged in that order using an automated stepping-table protocol. The lower limb was covered from the malleolar region to the inferior vena cava 10 cm proximal to the bifurcation. Sequence parameters were 4.36/1.49; flip angle, 30°; bandwidth, 270 Hz; matrix, 512 × 207; voxel size, 1.2 × 0.8 × 1.1 mm; 80 partitions; fat saturation; parallel acquisition; acquisition time, 20 sec. The pelvic region was visualized without parallel acquisition for better signal-to-noise-ratio (SNR): 2.5/0.98; flip angle, 20°; bandwidth, 690 Hz; matrix, 384 × 200; voxel size, 1.7 × 1.0 × 1.5 mm; 80 partitions; fat saturation; acquisition time, 19 sec. No contrast medium was administered after the patient was repositioned.